August Reutershan GmbH. & Co. KG. Solingen, Germany, established in Solingen in 1864. The company produce the Cork screw “Cork screw furnished with a bell-shaped housing” Patent Number 4658678 and “Cork screw having a bell-shaped housing” Patent Number 4570512, kitchen tools, penknife blades, Pocket Knifes, and in 1913 the SIEGER can opener. SIEGER Can Opener belongs to the official basic equipment of the German Wehrmacht during the World War 2. 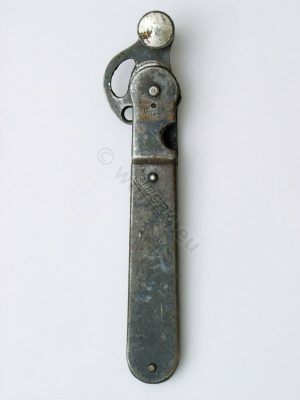 Previous PostRoyal can opener 1910.